If you haven’t booked your week in the mountains yet then you might just find some inspiration with our list of gay snow events taking place in Europe for the 2014/15 winter season. Arosa sits at the top of a typical Swiss mountain valley (5700 feet) and that means there’s sure to be snow! Whether you like carving the slopes and skiing back to your hotel at the end of the day, walking along the winter paths that lead you right through the ski area to the heart of town, or listening to the snow crunching under your feet as you stroll through the village – you’ll be right in the centre of the action. Alongside skiers and snowboarders, many non-skiers, après-skiers and others simply want to sunbathe in the complementary sun-loungers at the Tschuggenhütte facing the Weisshorn (8000 feet) and a breathtaking alpine panorama. There are 10 gay-friendly partner hotels (1 to 5 stars) offering various packages at special prices and you will find something to fit all budgets. The Event pass is offered at a discount price in all of our hotel packages and gives you access to all events as well as some other great advantages, such as 20% discount on ski or snowboard rental at the Bananas Ski + Snowboardcenter and 10% discount in various Arosa businesses. Some highlights: The classical concert at the village church, the gourmet dinner at the Tschuggen Grand Hotel (15 points GaultMillau), several theme dinners and a horse drawn sleigh ride through the village with the drag-queens participating at the Drag Ski Race. Clubbing nights with world-class DJs and Go-Go dancers plus a new pool party are also on the list. Small intimate ski week that focuses on the skiing, for the true snowmosexual. The Gay Ski Gathering will focus on a small group of keen skiers, from beginners to advanced who are keen to make the most of their time in the mountains and on the slopes. The group is lead by a seasoned skier who has spent several seasons working in the Alps. You can register your potential interest via their Facebook group, and you will be sent more details as the group develops. With great people. A colorful group of friendly gay men from different countries. Spending a holiday together, laughing together, with fun and joy. In the best location. A sunny, high-Alpine valley in the Graubünden region of Switzerland – Lenzerheide/Valbella. Skiing at its best, sure of snow. Easy to reach, far away from everyday life. In a special atmosphere. Being a guest. The Schweizerhof in Lenzerheide – a four-star-plus-hotel with style, Alpine charm and wellness for complete well-being. A winter wonderland. Pure relaxation. Pampering yourself. And meeting new people. In best company. Enjoying a long breakfast. Ski tours together. A gay cultural programme. Going for a drink or dancing together in the evening. With interesting people. Uncomplicated and heartfelt. A varied leisure programme and sport activities to your heart’s desire. Skiing, cross-country, winter walking, tabogganing, wellness, enjoying the sun terrace. Head north to the Norwegian ski report of Hemsedal for the fifth annual Scandinavian ski pride in 2015. Hemsedal is sometimes called the Scandinavian Alps thanks to the breathtaking scenery and high peaks. Experienced or novice – slopes in Hemsedal makes skiing into something really special, especially during the fun-packed pride festival programme! For their main winter event of 2015, Gay Ski Buddies will revisit the beloved ‘Cradle of Alpine Skiing’, the St Anton ski resort in Austria. St Anton will certainly dazzle you. After their fantastic experience last year, which left all the Buddies amazed by the diversity of runs and all around fantastic atmosphere, we were sure that this is going to become one of the Gay Ski Buddies’ favourites. 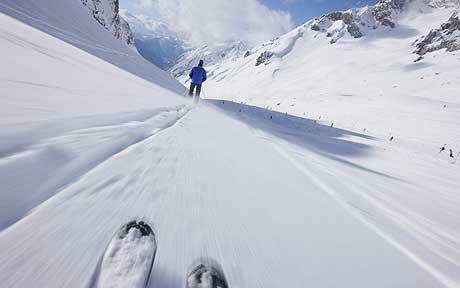 Martikas has confirmed that St. Anton will be ready to embrace them for another week of ski fun in March, 2015. Get your skis ready for more snow, more fantastic food and more great company. With its perfect pistes and Austrian charm, St Anton will entice you into a whirlwind of skiing adventures, followed by our trademark social events and legendary après ski. Charming and fun-loving chalet stuff will go above and beyond to show you the true beauty of Tyrolean hospitality. The European ski week has been running very successfully for several years and will for the first time take place in Avoriaz in the excellent Portes du Soleil ski area, with skiing in both France and Switzerland available. Once again there will be plenty non ski activities and also loads of parties as the organisers are clubbing giants Rapido. More information will be available shortly on their website. From the 21st to the 28th March, the world class and snow sure resort of Tignes, part of the Espace Killy (Tignes+Val d’Isère) the most beautiful ski area in the world, will be again hosting European Snow Pride for the thrid consecutive year, with even more guests, events and activities intended for both skiers and non skiers.